Get to play over 400 of your favourite casino games by just using your phone..
…And do it with aWelcome Bonus 100% up to $/£/€100 + 20 Free Spins on Shaman's Dream! Play Now! 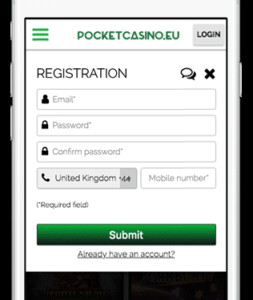 Pay and play using nothing but your Mobile Phone: Pocket Casino is your European Online Casino that you can carry around! PayViaPhone is a very useful app that you can download to your phone. With PayViaPhone, you simply add creditcards and your phone bill to your account. When you make a payment, you simply use your app and your payments are authorised within seconds! You will never have to worry about filling in credentials or looking for your card again! 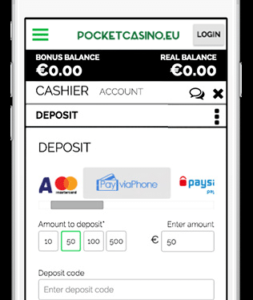 Like we said before: with PocketCasino and PayViaPhone you can play whenever you want and wherever you want using just your phone (with a wifi connection ofc)! Access over 400 games in just 2 minutes! We have over 400 game titles from premium developers like NetEnt and Microgaming. Including Video Slots, Scratch Cards and classic casino games like Roulette and Blackjack. Playing them all with a Welcome Bonus 100% up to $/£/€100 + 20 Free Spins on Shaman's Dream on your first deposit takes no more than 2 minutes! Really! Sign up step by step! First, simply click Join Now here or Register in the top right of the screen. We’ll ask you to fill in a short register form. To verify it’s really you, a confirmation mail or text message is send. Now go to the deposit page and click PayViaPhone. Choose the amount you want to deposit and submit. You did it! That didn’t take long did it? ;) As you can see you received Welcome Bonus 100% up to $/£/€100 + 20 Free Spins on Shaman's Dream on your first deposit! Why choose Pocket Casino as your PayViaPhone casino? PocketCasino holds a high standard of security, licensing, customer support and games. You can find all information regarding these subjects on our site. If you have any questions, feel free to ask our support. We are there 24/7 to answer all your questions! Start playing in 5 minutes!